Are you interested in learning how to become part of the market?! Please visit our Vendor Participation page located under the "More" tab. Summer Vendors from March to October at Bate Mill #5. 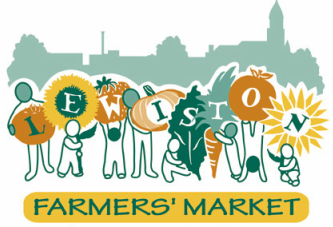 Winter Vendors from November to February at Lewiston YWCA. Occasional and Guest Vendors are not at market weekly. Please follow us on Facebook or sign up for our e-Newsletter for updates on attending vendors. Andrews Farm is a certified organic vegetable and fruit farm in Gardiner, Maine. Our farm sits 20 acres of scenic hilltop overlooking the town. Michael Perisho farms land that's been in the Andrews family for hundreds of years. A family run farm selling fresh seasonal produce grown pesticide free in Lewiston and Lisbon, part of New Roots Cooperative Farm. Blais Maple Syrup - [Summer & Winter Weekly Vendor] NEW VENDOR! Blais Maple Syrup was established in 2015 by Mario Blais and Marcel Blais. They started tapping trees as a hobby in 2012 with about 25 taps, today..1,200 taps! Located in Peru, Maine Clay Hill Farm sells assorted cuts of naturally raised Angus Beef, pork, chicken, eggs, seasonal produce including strawberries and raspberries. Clay Hill Farm - [Summer & Winter Weekly Vendor] NEW VENDOR! Chirp Creek is a small organic farm in central Maine growing high quality vegetables, delicious mushrooms and berries, and raising happy, healthy chickens, and hopefully pigs, cows and goats this coming season. Herban Works sells calendula salves, herbal teas, blended herbs, and lavendar pillows all handmade by a grassroots collaborative of Maine women who work to break isolation, build community, and invest in their own healing and development. Herban Works offers women with adverse life experiences the opportunity to work, develop a range of skills and life-giving experiences , and generate income in a safe and dignified space. Hometown History Works - Memories Made Manifest! Assorted hand made cards, Celtic ornaments and historical artwork. Family run farm selling fresh seasonal produce grown pesticide free in Lewiston and Lisbon, part of New Roots Cooperative Farm. Family farm, sugarhouse and store from Sabattus, Maine selling a wide variety of fresh produce, flowers, hanging baskets, seedlings, maple products, jams, jellies, relishes and more! Family run farm selling fresh seasonal produce grown pesticide free in Lisbon, part of Fresh Start Farms. ​Memarie sells hand spun, hand dyed yarn made from locally sourced wool. Mainely Soap provides handcrafted soap, both bar and liquid, body products including muscle balm, lip balm and Shea butter products, incense, laundry powder and stain sticks. Out of the greater Bethel, Maine area Mandy grows a wide variety of micro-greens indoors under low energy lights. Varieties include are Pea Shoots, Mustard, Radish Mix, Red Acre Cabbage, Kale, Arugula and Red Garnet Amaranth. A historic working vegetable and flower farm, bakery and caterer in Auburn, Maine selling bouquet's of fresh cut flowers, fresh herbs, select vegetables and baked goods, jams, jellies, and prepared food items. Stewart and Reid Bakers - [Summer & Winter Weekly Vendor] NEW VENDOR! Local artisan crafting unique and assorted handmade jewelry made from resin and clay with highlights of other items including buttons and beads. Located right in Auburn, Maine 4 ​Season Farm Market and Valley View Farm sell naturally raised vegetables, berries, eggs, honey, select baked goods, hummus and meat including assorted pork cuts and sausage. Vegetable Farm located right in Poland, Maine selling assorted seasonal vegetables and sun-ripened berries including strawberries and blackberries. Products can be found right at Verrill's Farm Stand in Poland. The Chef’s Cupboard, LLC. Is a new business venture right here in Auburn, Maine! They are creating new and exciting spice recipes for your kitchen. 1,000 High-bush pick your own blueberry farm in Lewiston! Nothing says summer in Maine like a pint of fresh picked blueberries!